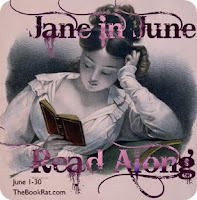 Welcome to Round 2 of the Jane in June P&P Read Along! Here is the linky to post your responses to the Round 1 questions/discussions. Round 2 questions are below. This linky is for ROUND 1 responses. The linky for Round 2 questions (below) will be posted next Wednesday, giving you the week to respond. This section includes one of the most famous scenes of the book: Lizzie's unexpected dance with Darcy at the Netherfield ball. Consider their awkward conversation during the dance, combined with the feelings and understandings of each (especially for Lizzie, who recalls Darcy did not want to dance with her and found her only tolerable the first time around, and who she thinks is responsible for the non-appearance of one Mr Wickham...). Discuss. And while you're at it, discuss the Netherfield ball in general. Lizzie's family seem out to make spectacles of themselves that night. Give us your own play by play, relate to the experience, mock, etc. Nowadays, P&P is just 1 book. But once upon a time it was comprised of 3 volumes. Volume 1 ends with Collins engaged to Charlotte Lucas and the Netherfield party gone from Netherfield. It's almost like the perfect act-break, with everything in shambles. Discuss your thoughts on the book to this point, and where you think it's going (if this is a reread for you, think back to how you felt the first time around, and compare it to how you feel now). The end of this section finds Lizzie and Jane split up, Jane to London to either reconnect with or forget Bingley, and Lizzie to Hunsford to stay with Charlotte (Lucas) Collins. What are your thoughts on this section? On Jane's reaction to London and her treatment by the Bingleys? Of Hunsford and Rosings, and the much talked of Lady Catherine? Discuss your thoughts on Wickham at the end of this section (when he is now rumored to be engaged to Miss King). Think about Lizzie's conversation with her aunt Gardiner, and Mrs. Gardiner's cautions to Lizzie about falling in love. Consider also, Lizzie's reaction to Wickham's pursual of Miss King and the light this puts on her feelings for Wickham. The rest of this section (through Chapter 29) is spent out of the company of beaux for the Bennet girls: Collins is engaged (and then married), Wickham has deserted Lizzie for an heiress, and Bingley and Darcy are out of the picture. During this time, you get to know Elizabeth and Jane better, and understand their day to day life. Discuss your impressions of the book during this time, when it is sans swoon-worthy men. Discuss the views of marriage in the book so far: Jane Austen is often written off as someone who writes fluffy marriage books (jokingly by those who've read her, seriously by those who haven't), but so far in the book, have their been instances of happy marriages? Think about the Bennet's marriage, Charlotte Lucas' views on marriage, Lizzie's reaction to Wickham's & Miss King, Mr Collins' proposal, etc. I'm a day late, but at least I finished! Thanks for hosting! I'm caught up for week one!